73/126 Kim Hollis Entertaining formula film. Stuck in development hell for years, the latest film from director Jon Turteltaub and King Midas himself, Jerry Bruckheimer, is slated to hit theaters this Thanksgiving. Nicholas Cage is Ben Franklin Gates, an archaeologist and modern day treasure hunter whose entire family line has been devoted to finding a treasure hidden somewhere in colonial America by George Washington, Thomas Jefferson and Benjamin Franklin. The treasure's (intended to be used as funds for the Revolutionary War) location may be somewhere in the words of the Constitution or perhaps on the back of the Declaration of Independence. Other cast include Bean as a British treasure hunter also after the Presidential stash and soon-to-be-really-famous Kruger (Troy) as the world's most attractive museum curator and token love interest. 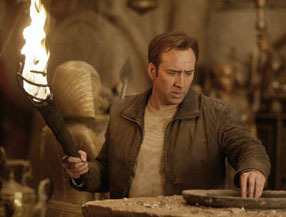 With a primo release date, the name power of Cage and Bruckheimer and an original story by Turteltaub, the stage seems set for one of the biggest hits of the year. But we do have to keep in mind that the script for this film went through a ridiculous number of screenwriters before finally being written by Cormac and Marianne Wibberley, who are responsible for classics such as The Sixth Day, I Spy, Bad Boys II and Charlie's Angels: Full Throttle. And while Turteltaub is a capable director, he can turn the cheese factor to 11 when he wants. And while it's a good bet Kruger will be 2004's Keira Knightley, the only known quantity other than Cage is Sean Bean (The Lord of the Rings: Fellowship of the Ring.